I used the bodice from the Butterick 3350 pattern, cutting it from the gown train. I also used the Butterick 3350 sleeve, cutting it from the beaded top front of the gown. I was able to use the gown’s skirt (taken in at the side seams and shortened, of course) and preserve the back of the gown (including the original zipper!) by stitching it right onto the new bodice. I made a sash from the extra buttons going down the gown’s back through the train. Finally, I snipped the beads from the remaining remnants and handstitched them around the front neckline. What a beautiful communion gown you have made. So special. My mum cut down her wedding dress to make my baptism gown and made debut dress. I think it is a wonderful idea. You have truly outdone yourself! This is GORGEOUS!!! Wow, that is simply beautiful. How sweet is it that you were able to reinvent such a special, treasured dress? I envy your sewing skills. Thank you so much for sharing this special project. You did a wonderful job… I love the idea of making something so special from something so special…Just lovely! Such a wonderful, special dress! Wow! The best refashion EVER! Beautiful! You are so sweet to say that. I think the best refashions have meaning like yours does. Have a great Sunday! I bet that was a scary project but you did a wonderful job! It’s beautiful! You did a great job! I would have been so afraid to attempt it. I’ll bet the little girl looks beautiful in it and I know the Mom is so happy to see her daughter wearing a special dress made from her special dress. I applaud you. Absolutely gorgeous! I’m always amazed at your refashioning projects, but this one is extra-fabulous! I love how you used the wedding dress embellishments for the sleeves and the back. That is one lucky little girl! Beautiful dress you made Katherine! you are so talented; you made this dress out of the wedding dress; the mother and daughter must be excited about this! so beautiful! You’ve outdone yourself Katherine, she’ll treasure it always. What a beautiful dress Katherine, absolutely gorgeous WELL DONE!!! Wow, that’s beautiful! What a fantastic job you did on this! And I think the idea of making something new out of the wedding dress is wonderful too. What a lovely dress and such a wonderful & poignent idea to make it from the wedding dress! The dress is stunning. You are braver than I would ever be to undertake such a delicate project. It turned out so nice. That dress is gorgeous, you did a fantastic job. 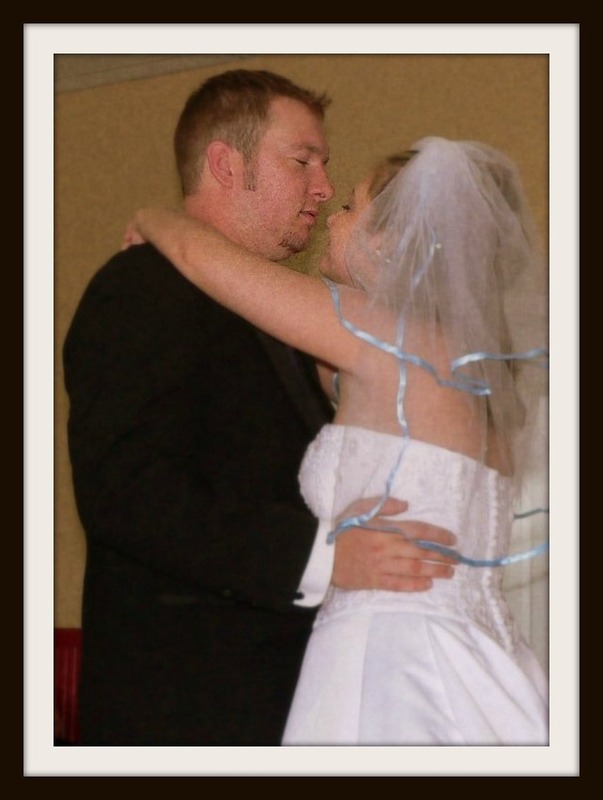 Even with your words of encouragement I would never touch a wedding dress out of fear. You are welcome it really is beautiful! It turned out beautifully. I am confident that everyone was in awe. Oh my gosh this brought tears to my eyes. What a great idea. Your work is exquisite. I bet your little first communioner (I don’t think that’s a word) looked precious. My first communion dress did not compare. I had to wear one of the dealie’s on my head too! I so enjoyed looking at it. It is so lovely. I will feel uplifted all day! You’re right! 🙂 But once I got to the point of no return, it was fine. 🙂 And thank you for the lovely compliment! Beautiful. And the back is just spectacular! What a great job you did; it is sure to be treasured. This is such a great way to get another use out of a wedding dress…and the project outcome is even more beautiful than I initially imagined! Brava! This is an amazing refashioning projects. You should get a medal on how to spend some thoughts and not money. It turned out great, all the details are just right! 😀 I especially like the way you used the buttons as a sash, so creative! Thank you!!! I was so honored to get to do this for Ally. It’s beautiful – you did a great job. Katherine – It came out soooooo nice! It’s beautiful! Such amazing and beautiful talent you have – this is so unbelievable! What a sweet compliment! Thank you, dear Antoinette! It’s so beautiful, the beading is amazing and I love the self covered buttons too. You are very clever! It turned out beautifully! 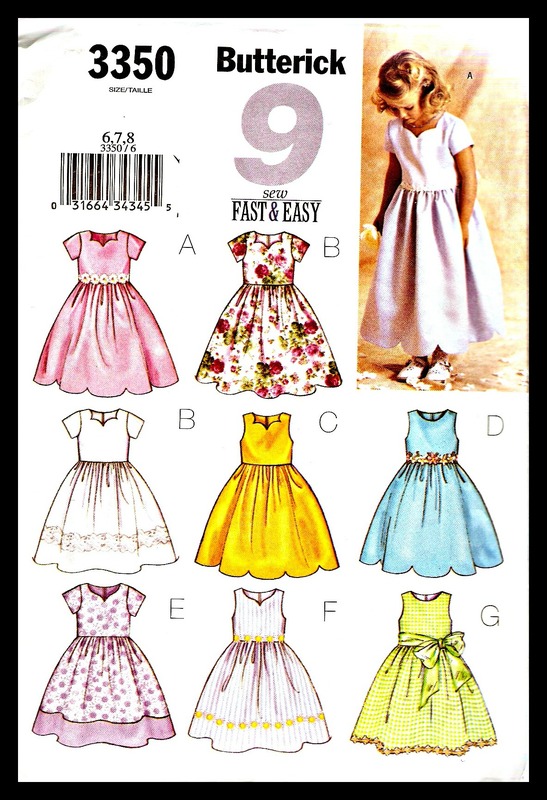 I love how you kept the feel of the original dress, and yet it’s also completely appropriate as a first communion dress. Well done! Stunning! What a special dress…made by a very talented lady! 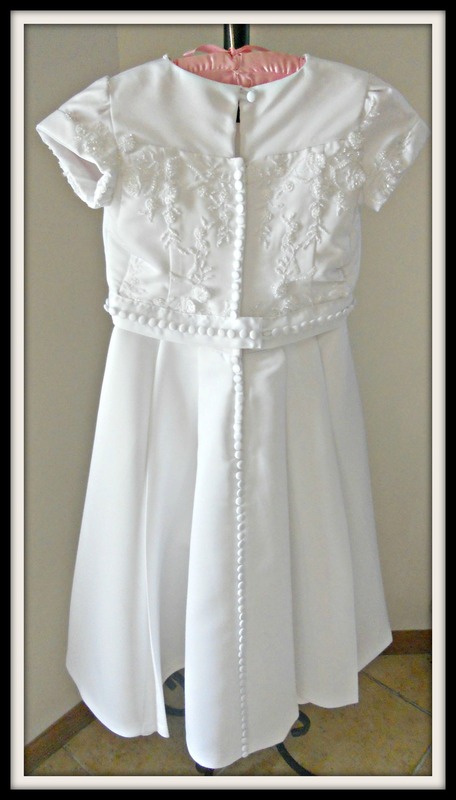 It’s an amazing transformation and such a great idea to turn a wedding dress into a 1st Communion dress. It is really a beautiful keepsake too. It turned out so well! Well done, that can’t have been easy! Wow! What a beautiful re-fashion! Great job! What a fantastic idea! 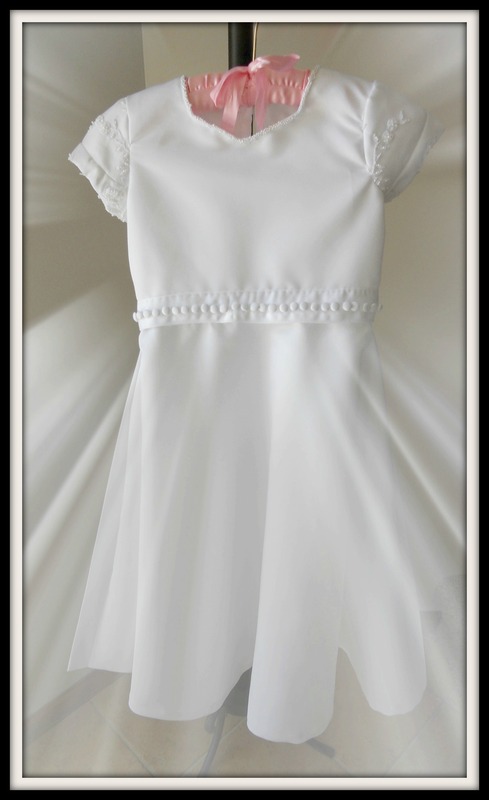 Especially considering as both wedding and communion dresses are so expensive and usually are only worn once! Back home in Ireland, it’s quite a tradition to make a Christening robe from the wedding dress, I had never heard of making the Communion dress from a wedding dress. You have two beautiful dresses there. This is so wonderful. I don’t recall hearing anyone has done this in my circle of friends and family and it’s such a great idea. What a lovely way to reuse such a special gown. But it must have been hard to make that first cut! Beautiful, unique and very special gown. Thanks for sharing! Love the special details and your great advice. Not that I sew or will be cutting up any wedding gowns, but still, seems spot on. Absolutely amazing. I am so impressed! This is just so gorgeous, wow!! I know this is an older post, but it bears one more comment: What a wonderful heartfelt idea. I still have my dress – – it survived my daughters playing dress up in it. If I ever have a grand-baby, I am following your DIY suggestions. What a priceless heirloom!